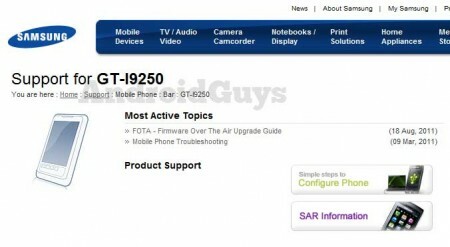 Rumored specifications call for an HD (1280x720) screen of 4.5" or possibly even 4.65" , a dual-core 1.5GHz processor, and Android 4.0 Ice Cream Sandwich. I suppose any news on this device is good news and shows there is definitely something going on.. you can check the model number on Samsungs support page Samsung for any further updates as we will also and if anything new pops up we will post it. As for different model #s, supposedly one is global and one isn't. Also, there is speculation that one will be the Nexus and the other will be some other Samsung phone. Nothing is confirmed as of yet. Refer to story below for additional information. Wow, maybe this baby will be ready sooner than later! I was going to jump on your case about the "supposevly" typo which is a huge pet peeve of mine. I'm by no means complaining ONE BIT, (because I'm buying this phone) but I really hope they up the camera to 8 megapixel from the "rumored" 5mp. And the fact that it's my only knock on a rumored phone spec, is remarkable. I'm so excited for this. I'm pretty sure I read somewhere the camera is 8 megapixels, I can't remember where but at this point all specs are still up in the air. Probably it'll launch in Korea in October with November to follow for the rest of the world , in December we'll hear rumors that VZ will get it in March and in April VZ will announce that they will never carry the Prime . In May , ATT , T-Mobile and Sprint launches their own versions of the phone . bionic out prime is in!